It’s a shame that people are always judged by their past accomplishments and rarely on their future potentials. That’s usually left to speculation. It would be nice if a page could talk about ambitions as well as past milestones. I’m gonna give it a try. One of dozens of helicopter sketches I made as a toddler. Photo from the TV series “Whirlybirds” which aired from 1957 to 1960. My original dream was to become a great cartoonist. I’ve been drawing since the age of two, and during that year I won a drawing contest called “Artist of the Day” in the Miami paper. It was a drawing of two men in a helicopter. I know what you’re thinking. What the hell did I know about helicopters at age two? It was because of two things: a bedtime storybook my Mom read me about helicopters, and a TV show called “Whirlybirds” about – guess what – two guys flying around in a helicopter! The show was cancelled the year I turned 2! The storyline usually consisted of the airborne duo confronting a natural disaster, crime or human errors. Notice how my drawing shows them rescuing a guy from the waterfall. I don’t know how I was able to identify with this flying object before I started school, but it seemed to serve me well. I found over 40 sketches of helicopters made by me during my kindergarten years. 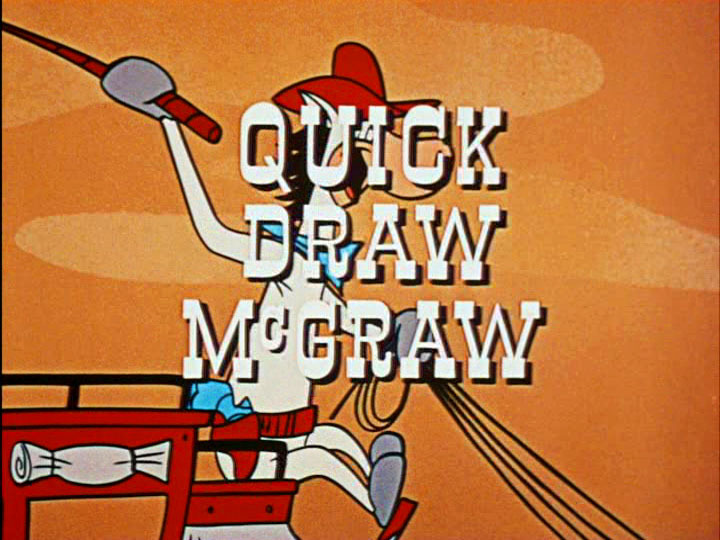 Eventually my fascination with drawing helicopters was replaced with Quickdraw McGraw. I found this character to be the addiction of my youth. The 1961 comic book cover I apparently had as a child. My feeble attempt at copying the cover. It was the best of all worlds. My love of westerns, my fascination with television, and my love of animated cartoons. It was a perfect match. Here’s the Opening and closing sequence of the show. Click the illustration to see the intro and outro of the 1961 color version (The previous 1959 version in B&W made a solid plug for its sponsor “Kelloggs”. I spend my time bouncing back and forth between graphic design and web design. I use my years of experience to train others how to be better at what they’re best at. I get a kick out of watching the light come on in their heads as they finally get what I’ saying. This website contains a showcase of work by current and former student designers I’ve had the privilege of working with. At time goes by, you’ll probably come to refer to this page as the dead zone. That’s a page you read once and never again. Don’t get too comfortable, though. I just might stick a few rants on this page from time to time. Also, I’ll be sticking a few secret links to stuff you can only access from this page. Yeah I know it sounds sneaky, but when you follow the ever-updating trail, I promise you this: there’s a gingerbread house for sale, formally owned by a diabetic widow.